CHAUVET® is proud to announce the latest addition to the Intimidator™ family of moving lights. Intimidator™ Spot 350 is the most powerful LED spot in the Intimidator™ line. A 75-watt LED combined with superior optics makes this fixture considerably brighter than most 90-watt LED fixtures currently on the market. This feature packed moving head features a motorized focus for crisp, rotating gobos when projected from most distances. A three-facet rotating prism splits the beam for great effects and to cover a larger area while interchangeable gobos allow for custom looks. Considering purchasing the Chauvet Intimidator Spot LED 350? Have questions? Ask people who've recently bought one. 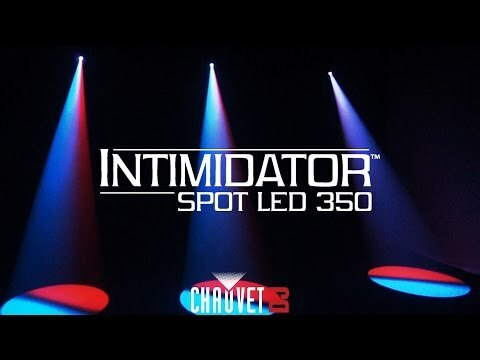 Do you own the Chauvet Intimidator Spot LED 350? Why not write a review based on your experience with it. Still one of our favourite bits of kit! This is an amazing moving head with so much to offer. The output is amazing and so are the optics that it produces. It may be expensive but is well worth the buy!! Perfect!!! Best Moving Heads Used ! Such a small and mighty light. This is a very powerful light and by having a couple of these your show will be sorted. Has a lovely range of colours. Intimidating by name,Intimidating by nature, the power of this fixture really is amazing! Just 4 of these really enhanced a show we recently put on. The brightness is truly remarkable, the choice of gobos and colours is also very good! 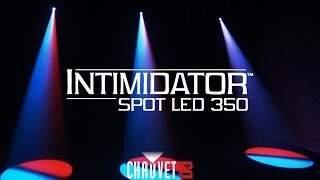 Seen a video for Chauvet Intimidator Spot LED 350 online or have you own video? Check out Chauvet Intimidator Spot LED 350 on DJkit.com!